Just a couple of pictures from the most recent Team Phungo trek to the ballpark, a 3-2 loss to the Division leading Nationals. The Phillies may look ugly on the diamond but the field still can look nice. The Phillies didn’t have many highlights in the game. Both runs came courtesy of a Ryan Howard Homer. The above in the above shot is not the from the Home Run AB, this is the Bottom of the 5th - one of two times when Howard Struck Out. The Star of the night was Max Scherzer who took a no-hitter into the sixth and struck out 11 over eight innings. 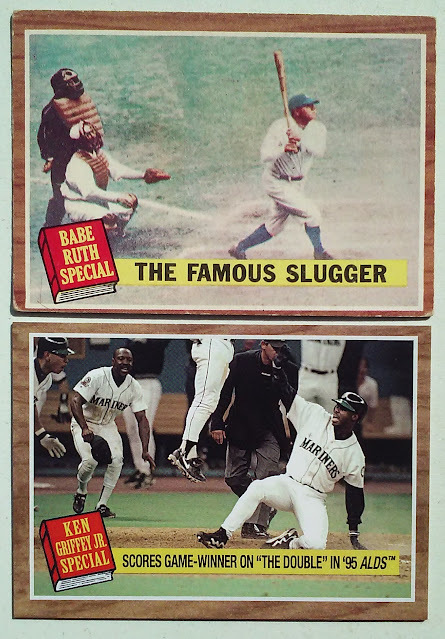 As a batter he also successfully executed a suicide squeeze to give the Nats their third run – which ended up being the difference in the game. The Phillies starting pitcher, Jerad Eickhoff, fought through some early control issues and was able to give the club six innings. If it weren't for a misplayed fourth inning fly ball by Aaron Altherr in the fourth inning, Eichoff may have left the game deadlocked 2-2 with the Nats and Scherzer. Nats Rookie Trea Turner is having a good season. The outfielder had a pair of hits on Wednesday boosting his average to .344. Ahh time to return to a feature that we haven't had in a while Bucket or Chuck-It. Bucket is good as in add it to your bucket list. Chuck-It is bad as in Toss it out like a pair of worn sneakers. All seaon Jim from the Phillies Room has been picking up Phillies related Topps Now cards in bulk and passing along cards to other Phils collectors. I find the cards unique and as a fan of game dated cards the concept appeals to me, especially when someone like Jim is dedicated to do all the work of submitting the requests to Topps. There have been at least 6 Phillies Topps Now cards and I would like to get to those and a More dedicated thank you to Jim in a future post. 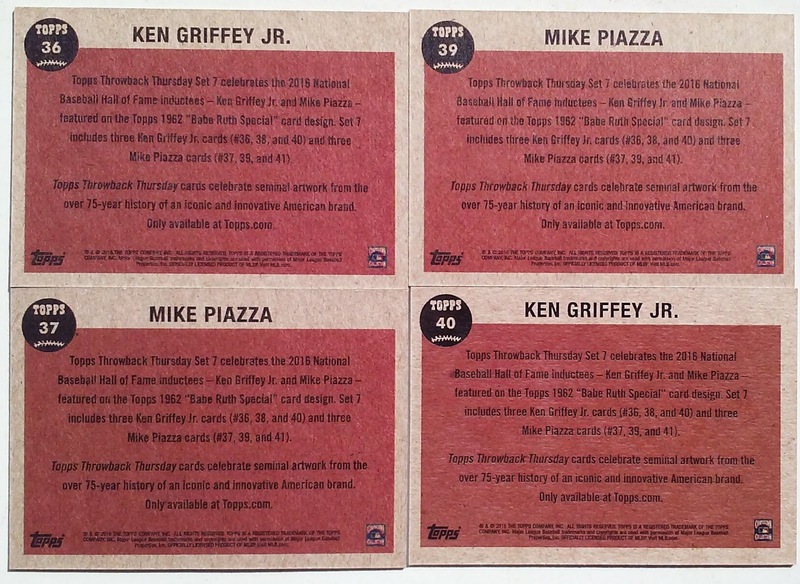 I myself hadn't picked up anything directly from Topps until recently when I saw in celebration of the Hall of Fame weekend they issued a "bundle" related to this year's inductees Ken Griffey Jr and Mike Piazza. The six card set is inspired by the 1962T Babe Ruth Subset with 3 cards dedicated to each of the new Hallers. 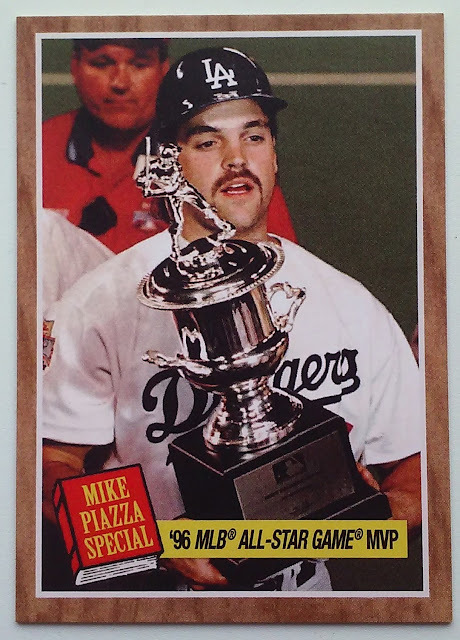 The second card of the set features a photo of Mike Piazza receiving an the 1996 All-Star Game award. This card was appealing to me as a Piazza fan and it is a nice add to my local players collection, but the real draw is that the 1996 ASG is a Phungo Game and This is a card I can add to the Phungo Games collection. 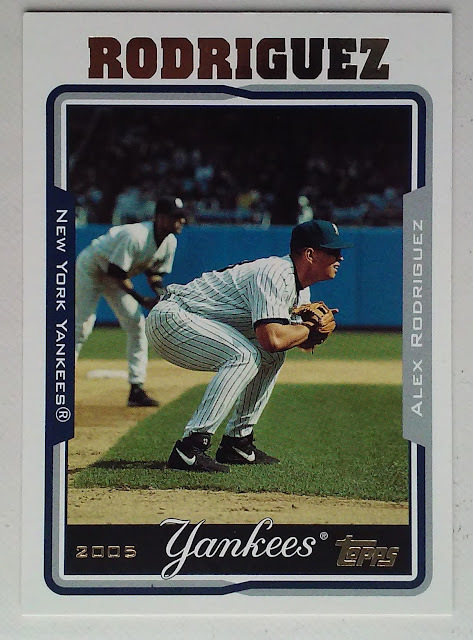 Despite the fact that the image on the card makes Piazza appear as if he had a few to many at the family picnic, I do like the front of this card. Topps mailed it in on the b-sides for the text. The backs of all six cards have identical text. The only thing that differentiates each card is the number and the player name. It's a shame, if these are such big events in each players career how about paying a writer and a copy editor (or even an intern) for a couple of days work to come up with a paragraph. This is a $20 set of six cards, that can be produced months in advanced - it's not like they woke up on Wednesday and said "Hey we need to put out a Throw Back Thursday set tomorrow" or maybe they did. Check out this example of an original 1962 Babe Ruth Special. We have a pretty detailed summary of Ruth's rough 1925 season. 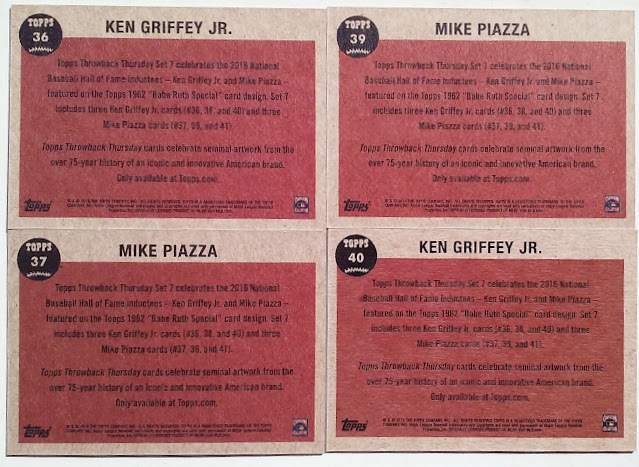 On the New Piazza card all you get "Hey look at us, we have been making cards for 50 years and Mike shares this documentation with Ken Griffey Jr"
Just for comparison we present the front of one of the other TBT specials with Babe's original. 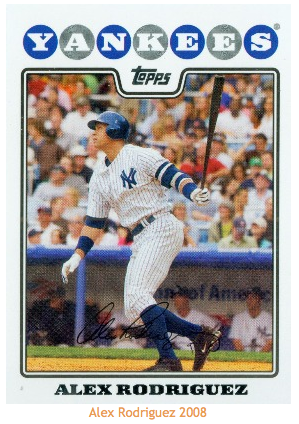 I think Topps did a decent job on the fronts, just wish they would have carried through to the back. Very disappointed, Great Concept, I think Topps picked a great subset to use for these cards, but the execution of the backs is insulting, especially for a set that runs $20. 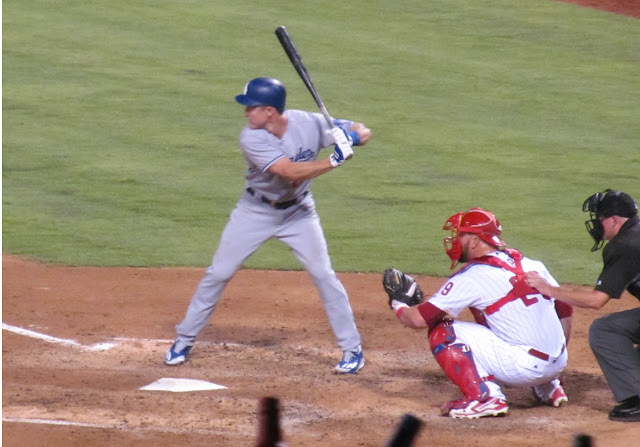 There are things you expect - Chase Utley Getting a Standing Ovation, and there are things that your happy to see but don't really expect - Chase Utley's Ovation extends for a second beat, and he needs to settle the fans so the game can start or Chase Utley hits a Home Run in his return. And Then there are miracles - Chase Utley and Ryan Howard turned back time. Utley Hit a Grand Slam and got a second curtain call, at this point what was a game at moved into theater. It was watching "the Natural' unfold in real life. Later Ryan Howard would hit a moonshot Home Run into the Phillies Bullpen, after narrowly missing one earlier in the game. It was as much fun as a fan can have in a 15-5 Loss. The Philllies may have been down 10 runs, but for a few hours it felt like 2008 again. The crowd was good size, Everyone was excited and engaged - and I felt eight years younger, Now that's a miracle! 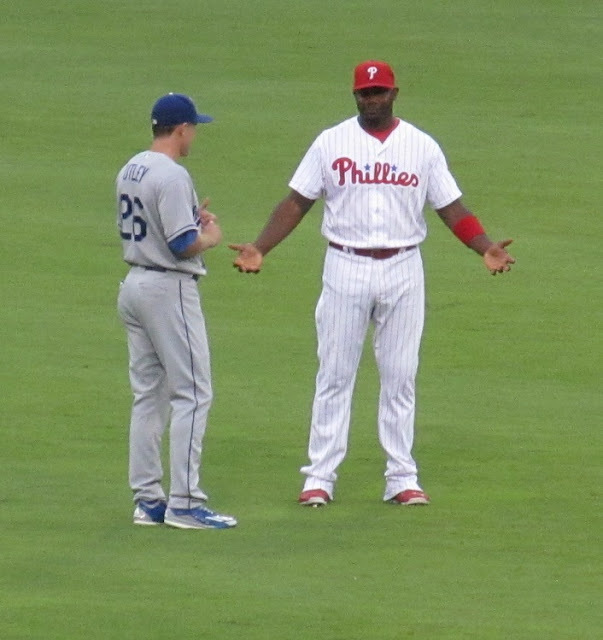 Utley and Ryan Howard Pregame. I think Howard is saying "well if you hit a Home Run, I am going to have to hit one too.."
Utley signed a number of autographs pregame. The fans were four of five deep down the Left Field line. Good Guy Awards go out to Corey Seager and Chris Taylor who also were spotted signing for the fans. Last night was Beatles Night - in celebration of the 50th anniversary of an appearance of what turned out to be the bands US Farewell tour. 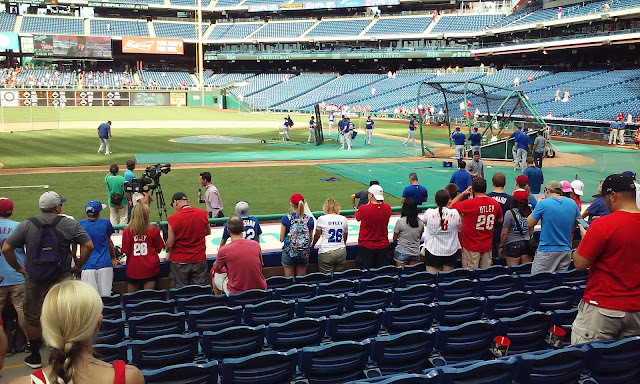 Our friends over at the Phillies Room were also at the game and they have their own field report which can be found here. Jim Thome: Welcome to the Wall! 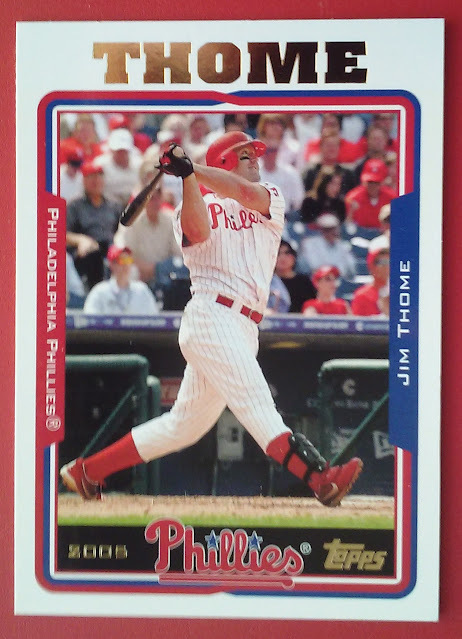 The Philllies are adding a Jim Thome plaque to their Wall of Fame tonight. I won't be there for the induction but do plan on getting down to the park at some point this weekend. Remember a few years back when there was a buzz regarding Topps giving players card numbers that matched their uniform numbers. 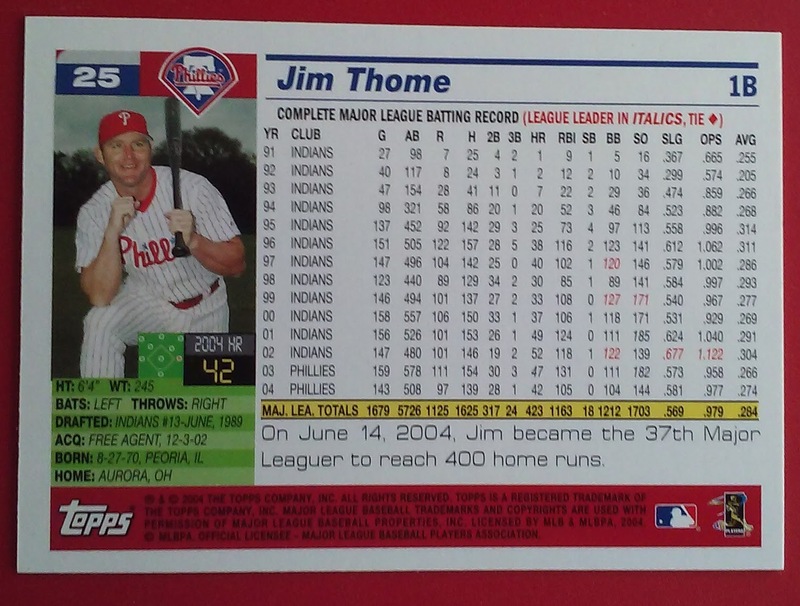 This Thome card is pre-buzz but it does fall on his #25. One of the reasons that I like this card is the fun fact, "On June 14, 2004, Jim Became the 37th Major Leaguer to reach 400 home runs." First off I respect the accomplishment and I am happy that the prodigious home run hitter reached the milestone while with the Phillies. More selfishly I think it is cool that it was a game attended by Team Phungo. Citizens Bank Ballpark was brand new at the time, there was always buzz at the stadium - even more so with a potential Thome Milestone. June 14 2004 was a rainy Monday night in which the Reds were in town to make up a game that had already been postponed once. None of this could damper the spirits of the fans there to see if Thome could hit #400. He didn't make us wait long - He homered in the first inning. Except that there was the issue of a potential rainout - what would happen if the game didn't go the required 5 innings? 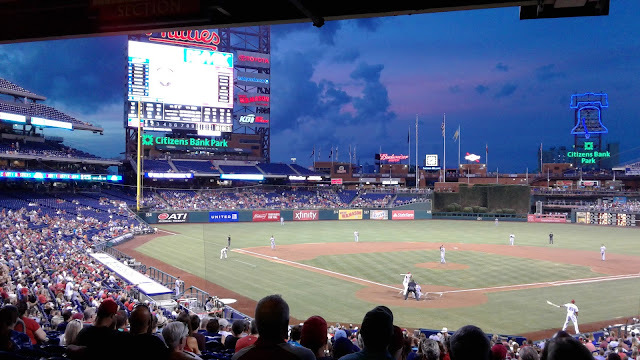 The clubs played through some rain and there were delays but the clubs eventually finished the contest (officially) with the Phillies winning 10-7 in a weather shortened 8 innings. Someday I will dig through my ticket stubs and add one to this post. Last Year in the wake of the commotion regarding Topps awarding the #1 Card to Derek Jeter we took a look at the other lead off cards from Flagship. One of the things we found out was that the Captain had not made the top spot previously. This isn't A-Rod's first #1 but it is the first time he was honored with the top spot as a member of the New York Yankees. I am not positive but I am pretty sure that is Derek Jeter hovering in the background. 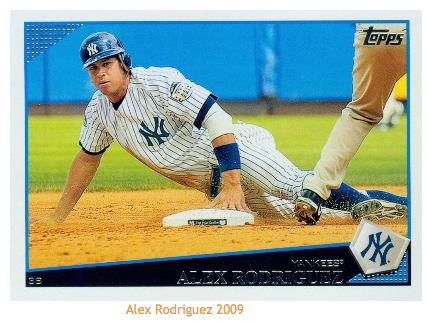 The photo and the card is a summary of Alex Rodriguez's Yankees career. No matter what he did Jeter would always be looming. 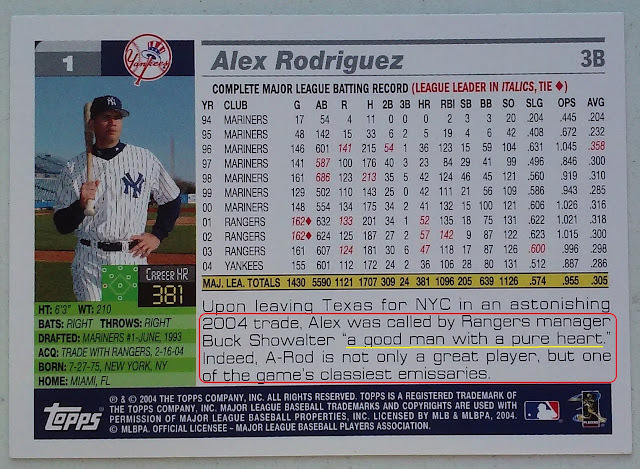 Given his polarizing career and personality, I found the Buck Showalter Quote and related Text on the back of A-Rod's 2005 Card pretty amusing. "A Good Man with a Pure Heart" and "One of the game's Classiest Emissaries" are definitely not in the narrative I most often see associated with Alex Rodriguez. Alex occupied the top spot four other times including three with the Yankees. He is the sole 5 time member of the Topps #1 Club. 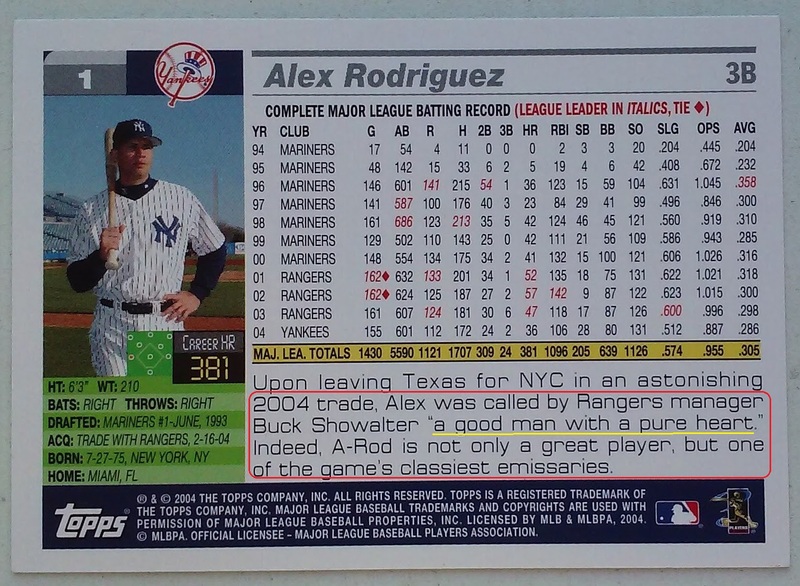 Realizing that Alex Rodriguez is a Five Time Topps Lead-Off player reminded me of "The Five Timers Club" sketch on Saturday Night Live. Essentially anyone that has hosted the show five times a member of an exclusive club. Folks in that club include Tom Hanks, Steve Martin, Alec Baldwin, Paul Simon and Justin Timberlake. 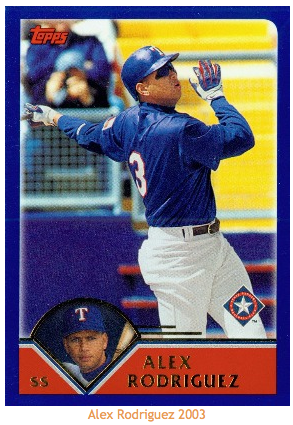 Alex is the charter member of the Five Timer Club related to #1 Cards in Topps. 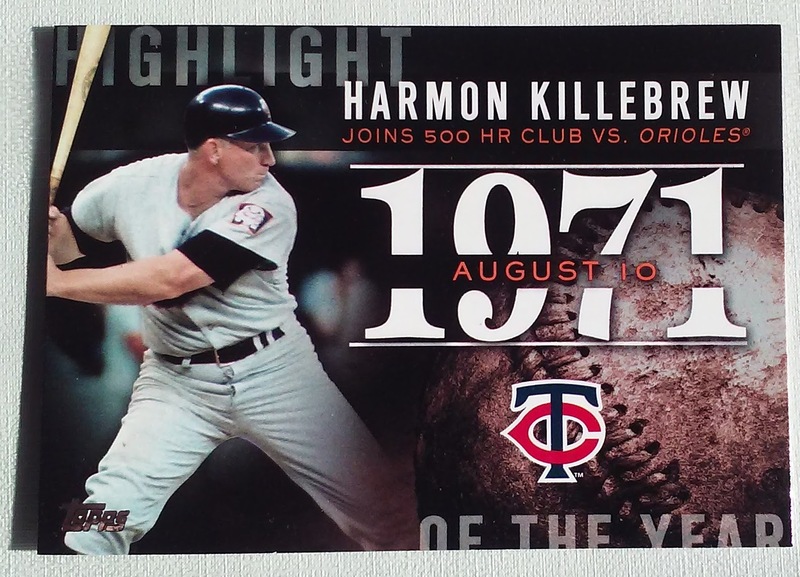 Anniversary: 45 Years ago Harmon Killebrew Joins 500 HR Club. 2015 Topps #H-74 Harmon Killebrew 500 Home Runs. The event was honored in Topps 2015 Highlight of the Year insert. 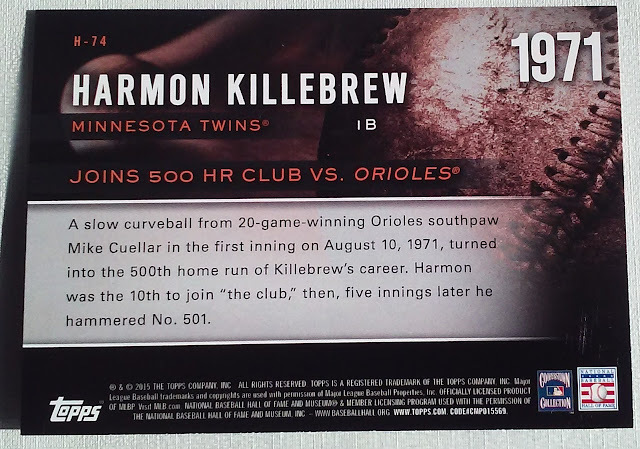 A brief synopsis on the back of the card also notes that the hit was part of a pretty big day for Killebrew in which he had a pair of Home Runs, both lead changers, and 3 RBIs. 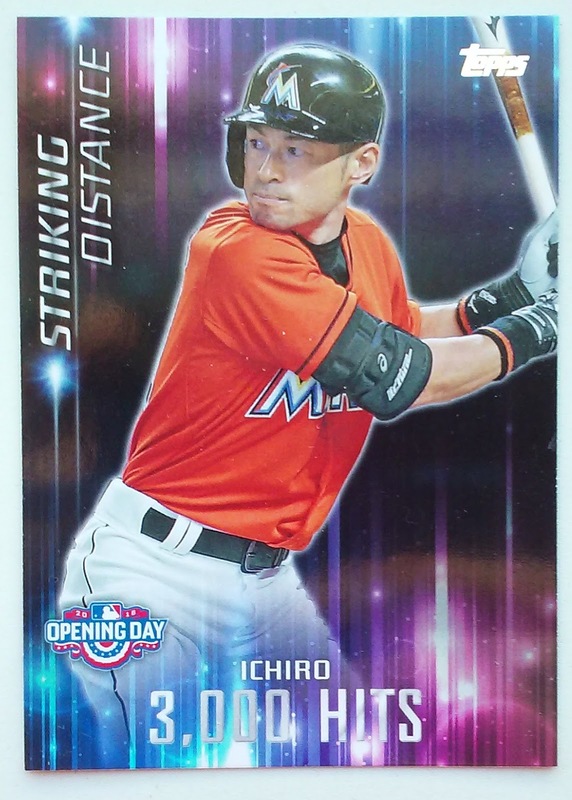 One of the inserts in 2016 Topps Opening Day is Striking Distance which salutes a bunch of upcoming milestones. The Subber is anchored by Future Hall of Famer Ichiro Suzuki, typically referred to as simply Ichiro. Topps took a chance on this one, at the beginning of the season Ichiro was 65 hits short of 3,000. That number isn't a gimme for a 42 year old who collected just 91 hits in 2015. Topps also gambled on the success of the Miami Marlins. Had the club performed poorly they may have ended up trading Ichiro before he reached the milestone. 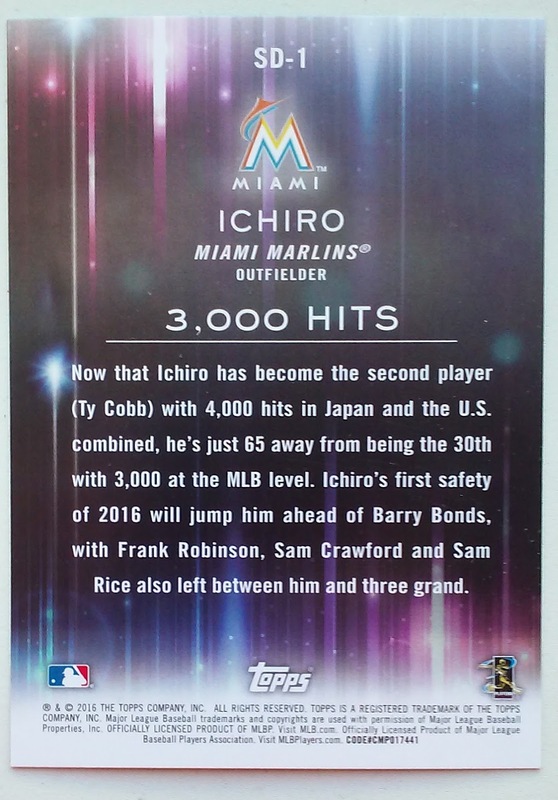 Notice anything wrong with the text on the Ichiro's Striking Distance Card. In 2013 Topps elected to erase Pete Rose when mentioning the All-Time Hit record on their 2013. 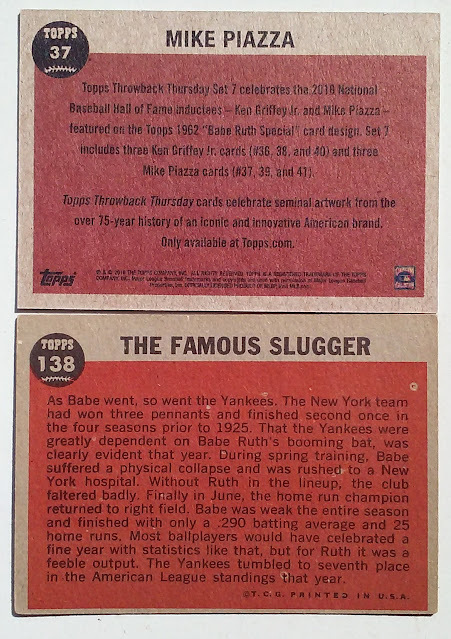 On the above card they have not just erased Rose's name, Topps has elected to completely ignore his accomplishments. Maybe my math is off but I would think Pete Rose's 4256 Major League Hits would qualify him for the World 4,000 hit club.